Paintings by Frida Kahlo inspired poet Pascale Petit to write a collection of ekphrastic poems. Shown here: Portrait as a Tehuana (cropped) by Frida Kahlo. Ekphrastic poetry explores art. Using a rhetorical device known as ekphrasis, the poet engages with a painting, drawing, sculpture, or other form of visual art. Poetry about music and dance might also be considered a type of ekphrastic writing. The term ekphrastic (also spelled ecphrastic) originates from a Greek expression for description. The earliest ekphrastic poems were vivid accounts of real or imagined scenes. Through effusive use of details, writers in ancient Greece aspired to transform the visual into the verbal. Later poets moved beyond description to reflect on deeper meanings. 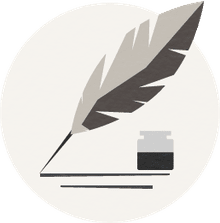 Today, the word ekphrastic can refer to any literary response to a non-literary work. More than 2,000 years ago, epic poets used ekphrasis to help audiences visualize legendary battles. They created an enargia, or a vivid word painting. For example, Book 18 of The Iliad (ca. 762 B.C.) includes a lengthy detailed visual description of the shield that Achilles carried. The author of The Iliad (said to be a blind poet known as Homer) never actually saw the shield. Ekphrasis in epic poetry usually described scenes and objects that were only imagined. Since the age of Homer, poets have devised many different ways to interact with art. They analyze the work, explore symbolic meanings, invent stories, or even create dialog and dramatic scenes. The artwork will often lead the poet to new insights and surprising discoveries. The subject of the ekphrastic poem can be about an actual artwork (actual ekphrasis) or a fictional object like Achilles' shield (notional ekphrasis). Sometimes the ekphrastic poem responds to a work that once existed but is now lost, destroyed, or far away (unassessable actual ekphrasis). There's no established form for ekphrastic poetry. Any poem about art, whether rhymed or unrhymed, metrical or free verse, may be considered ekphrastic. Each of the following poems engages with a work of art. Although the poems are very different in tone and style, they are all examples of ekphrastic poetry. Emotional Engagement: Anne Sexton, "Starry Night"
The short free verse poem mentions details from the painting, but the focus is on the poet's emotional response. Rather than dispassionately describing van Gogh's work, Anne Sexton engages with the painting in a highly personal way. Direct Address: John Keats, "Ode on a Grecian Urn"
"What men or gods are these? What maidens loth? What pipes and timbrels? What wild ecstasy?" The figures on the urn seem all the more hopeless because they're frozen on an artifact that is timeless. However, Keats' controversial lines — "Beauty is truth, truth beauty"— suggest a type of salvation. Beauty (visual art) is equated with truth. "Ode on a Grecian Urn" might be interpreted as a manifesto that celebrates ekphrasis as the path to immortality. Symbolic Interpretation: Wislawa Szymborska, "Two Monkeys by Brueghel"
"Two Monkeys" is an allegorical scene by the Dutch Renaissance artist Pieter Bruegel the Elder (c.1530–1569). Bruegel (also known as Brueghel) painted two monkeys chained in a open window. For more than 500 years, the tiny work — no taller than a paperback novel — has stirred speculation. Why does one monkey gaze out at the sailboats? Why does the other monkey turn away? with a soft jingling of the chain." By introducing the student's confusion and the surreal exam, Szymborska suggests that the monkeys symbolize the hopelessness of the human condition. It doesn't matter whether the monkeys gaze out the window or face the room. Either way, they remain enslaved. Paintings by Pieter Bruegel are the basis for a variety of ekphrastic writing by some of the most noted poets of the modern era. Bruegel's "Landscape with the Fall of Icarus" stimulated famous poems by W.H. Auden and William Carlos Williams. John Berryman and countless others responded to Bruegel's "Hunters in the Snow," each poet offering a unique impression of the scene. Personification: Ursula Askham Fanthorpe, "Not My Best Side"
English poet U.A. (Ursula Askham) Fanthorpe (1929–2009) was known for irony and dark wit. Fanthorpe's ekphrastic poem, "Not My Best Side," draws inspiration from "Saint George and the Dragon," a medieval illustration of a legendary tale. The artist, Paolo Uccello (c. 1397–1475), certainly didn't intend his painting to be comical. However, Fanthorpe invents a speaker who presents a comical and contemporary interpretation of the scene. Liked, if you know what I mean." The irreverent monologue seems all the more humorous in the context of Uccello's painting and the ancient tale of male heroism. Added Dimensions: Anne Carson, "Nighthawks"
American artist Edward Hopper (1886–1967) painted haunting views of lonely urban scenes. Anne Carson (1950– ) pondered his work in "Hopper: Confessions," a series of nine poems featured in her collection, Men in the Off Hours. Anne Carson's Hopper-inspired poems combine ekphrasis with quotes from the fourth century philosopher St. Augustine. In "Nighthawks," for example, Carson suggests that the passage of time has created distance between the figures in the diner that Hopper painted. Carson's poem is a reflective monologue with staggered lines that convey a sense of shifting light and shadows. "Nighthawks" concludes with St. Augustine's startling quote about the way time shapes our lives. By juxtaposing words from the philosopher with words spoken by characters in the painting, Anne Carson brings a new dimension to Hopper's work. Shortly after her divorce from fellow artist Diego Rivera, Frida Kahlo (1907–1954) painted a surrealistic self-portrait. 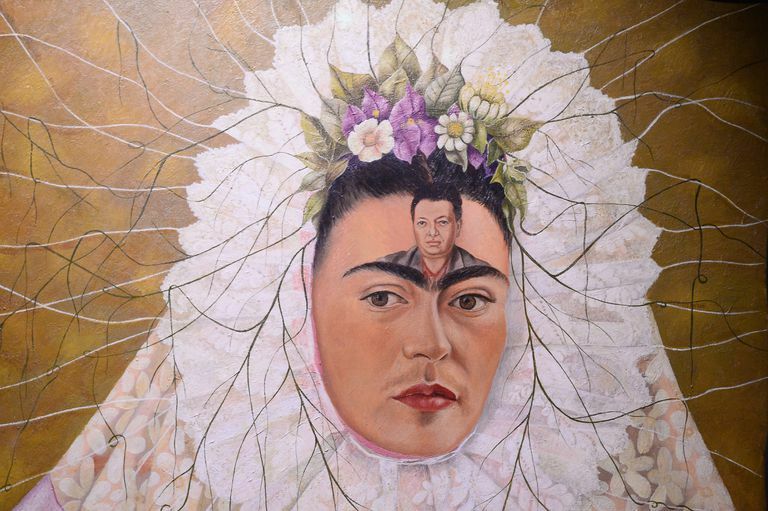 The painting stirs many questions: Why is Kahlo wearing a lace headdress? What are the lines that radiate around her face? Why is Diego Rivera's image painted on her forehead? To practice ekphrasis, write a response to Kahlo's painting. You can invent dialog, create a story, ask questions, or reflect on what details in the painting mean. You can speculate about Kahlo's life and marriage, or you can relate the painting to an incident in your own life. Poet Pascale Petit (1953– ) responded to Kahlo's self-portrait in a poem titled "Diego on My Mind." Petit's book, What the Water Gave Me: Poems after Frida Kahlo, contains 52 ekphrasic poems that illustrate a range of approaches. Her writing process, Petit told Compass magazine, involved looking closely and deeply at Kahlo's paintings "until I felt a trance that felt true and fresh."